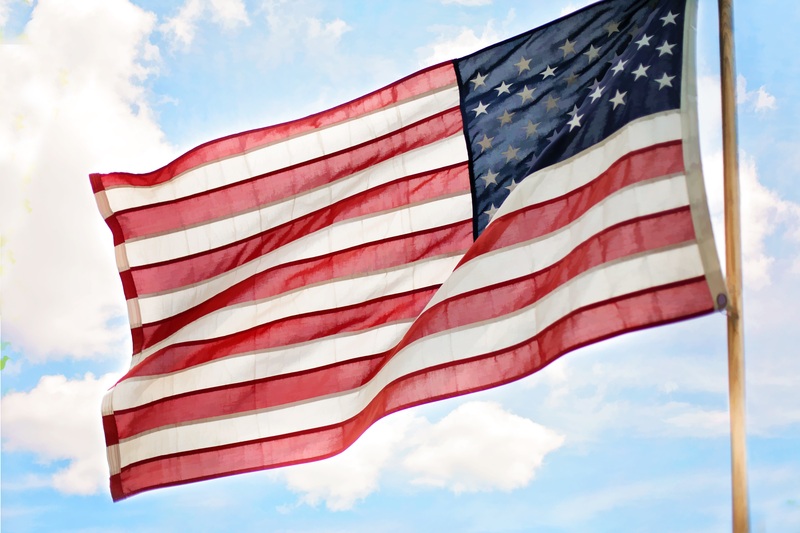 The American flag is meant to be enjoyed and celebrated as a symbol of a living country. When we respect the flag, we respect the sacrifices men and women made to build and establish freedoms that we enjoy to this day. Here are a few tips on how to care for your beloved symbol of patriotism. The flag must be displayed from sunrise to sunset. The flag may be displayed at all times if it is properly illuminated in darkness. When the flag is displayed on a single staff or lanyard, it must be displayed above all other flags. If the flag is displayed in a row with other flags, it must be the first flag to the observers left. Flags of other nations may be at the same height, but typically state flags or other associations flags are displayed lower. If the flag is used in a marching band or parade with other flags, the flag must be displayed to the observers’ left. On special days, the flag may be flown at half staff. On Memorial Day, the flag is flown at half-staff until noon and then raised. If the flag is displayed at half-staff, it must first be raised completely for an instant and then lowered to half. When it is lowered for the day from half-staff it must first be raised to the peak. When the flag is displayed over the middle of a street, it should be suspended vertically with the union (blue field of stars) to the north in an east and west street or to the east in a north and south street. If the flag is placed on a stage or podium, it must be displayed to the speaker’s right. Other flags may be placed to the speaker’s left. When the flag is displayed against a wall or flat surface, the union (blue field of stars) must always be uppermost and to the observer’s left. When displayed in a window, the union should always be uppermost and to the observer looking in to the window’s left. When displayed on a car, the staff must be affixed firmly to either the chassis or clamped to the right fender. 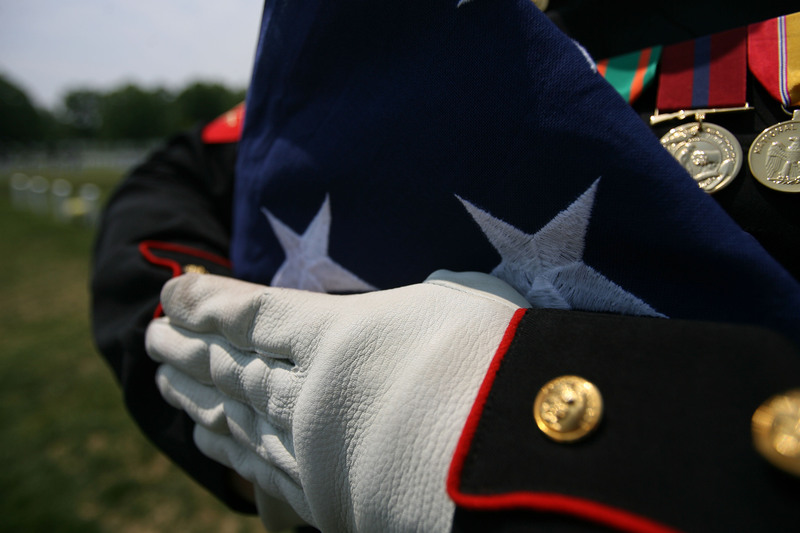 When the flag is used to cover a casket, the union should be placed at the head and over the left shoulder. Also, the flag should never be lowered into the grave or touch the ground. Everyone present who is dressed in uniform must render the military salute. Armed forces members or veterans who are present but not in uniform may also render the military salute. 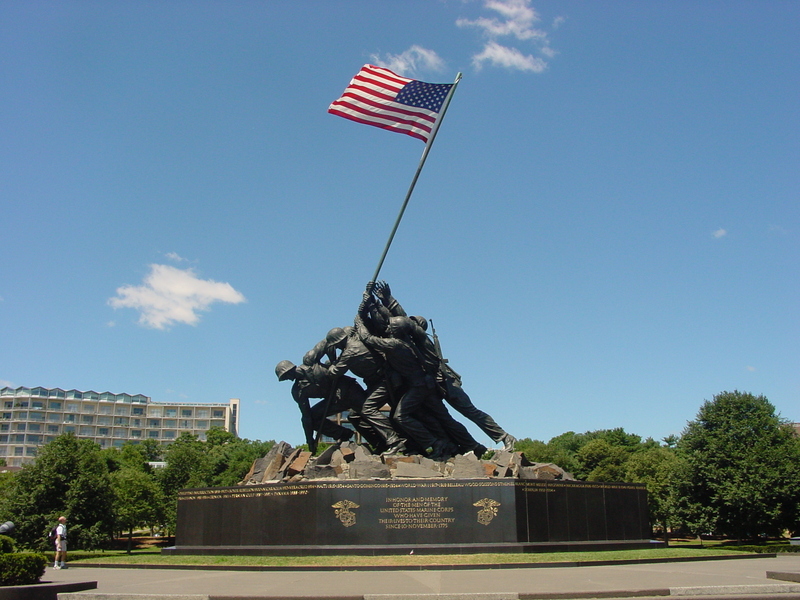 Everyone present should face the flag and stand at attention with their right hand over their heart. If they are wearing a hat, they must remove it and place it over their left shoulder, so that their hand covers their heart. Fold into the traditional triangle; never wad up the flag. If the flag must be disposed of, it must be folded appropriately before it is burned. Ensure that the fire is sufficient to completely burn the flag. After the folded triangle is placed in the fire, the individual(s) may salute the flag, recite the Pledge of Allegiance, and observe a brief moment of silence. After the flag is completely consumed, the fire must be safely extinguished and the ashes buried. Do not let the flag touch the ground. The flag should only be flown upside down if there is an emergency. Do not store the flag where it can get dirty. Do not use the flag as clothing, a cover, or to carry things. The flag should never be drawn on or marked upon. Always allow the flag to fly free; do not tie it back. Do not dip the U.S. flag for any person, flag, or vessel. The flag is not intended for decoration. Use a bunting with blue on top, followed by white and red for patriotic decor. JM Cremp’s wishes you a wonderful 4th of July holiday, and wants to thank all past, present, and future service members and their families.